Zone Crush Proof body lift blocks are capable of holding up to 60,000 lbs. New longer grade 8 body bolts are included. 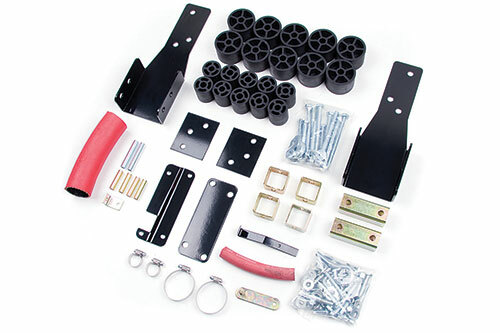 Our body lifts are designed for easy installation as well as long term performance. Every thing you need to properly lift the body is included with detailed instructions to make for an easy installation. Both front and rear bumper relocation systems are included for a clean original appearance. Even the front tow hooks are retained and fully functional. If you want a complete system, then this is the kit for you. Rear bumper brackets are for appearance only. Ther rear bumper cannot be used for towing after installation. Vehicles equipped with the Vortec V6 will require modification of the air intake.